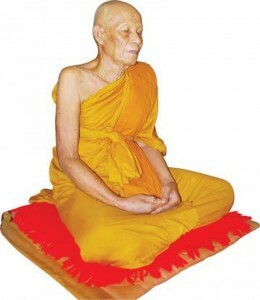 Pra Upachaya Luang Phu Juea Jidtiyano is Currently 83 Years Old (written in 2012). Por Tan Juea is the Abbot of Wat Sawang Nong Waeng Ban Phai, in Tambon Jorakhae Hin in Nakorn Rachasima. He was Ordained into the Buddhist Sangha in 2495 BE. In the Year 2512 B E, he was given the status of Upachaya. In 2552 BE, he was given the Status of Pra Racha Kana. He is the Popular Kroo Ba Ajarn of many Famous and Successful Rich Moguls, Captains of Industry, Politicians and Influential Persons. They hold Luang Phu Tan Juea as the cause of their Great Wealth, Success and continuing Prosperity. He is known for his Humble, Kind, and Generous Attitude full of Compassion. He is a Samatha Monk who sits often in deep meditation. His Upachaya and early mentor was Luang Phu Taw of Wat Jorakhae Hin, a Great Master of the Olden Days, who taught him many Wicha. Luang Phu Taw was a monk who possessed various Abhinya Miracle Powers, and was a teacher of the highest practices. 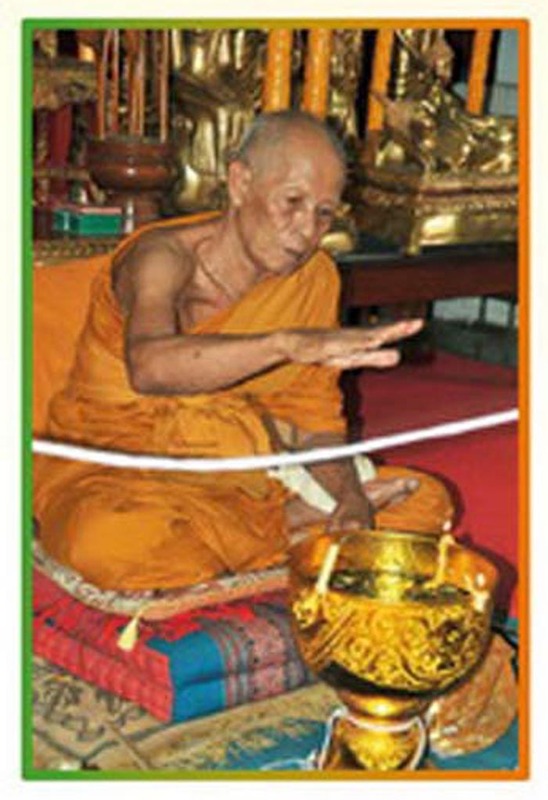 Por Tan Juea’s other main Kroo Ba Ajarn in Wicha was Luang Por Hwang, the Lineage Holder of the Wicha of Luang Por Noi of Wat Ban Pai in Kora Buri. LP Hwang was a Isan Sorceror with many powerful Khmer Wicha, which he passed on to Por Tan Juea. During his lifetime, Por Tan Juea also studied apprenticeships inb Sorcery under Luang Por Pra Atigarn Iw of Wat Ampa Phon and the great Luang Phu Nin of Wat kora Buri, Luang Por Dto of Wat Bor Daeng (who was the Sjarn of Luang Por Sorn of Wat Serng Sang). This compendium of Lineage Master Wicha makes Luang Phu Tan Juea a True Boroma Ajarn of the ‘Chan Kroo’ (Master Adept) variety.